This photo clearly does not do Debra’s work justice…envision!! Several baby items popped up this week. 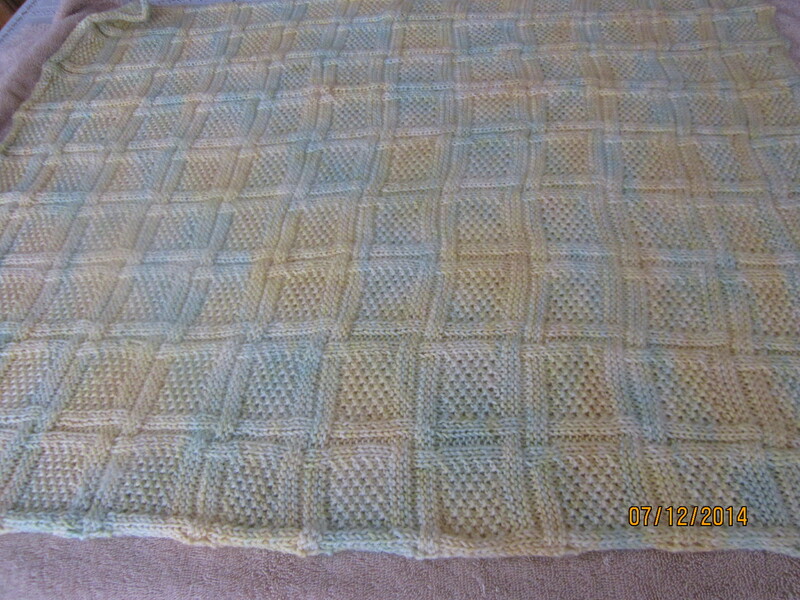 Debra finished her Textured Interweave Baby Blanket (actual name of pattern)….the subtle color variegated choice with the detailed stitching pattern was perfect. She did labor a bit over some mis-knit stitches…but not to worry she was able to get back on track with either my help or her own. I love this design and I think I have to knit it….I know there are babies on the horizon in this family. You can find the pattern at Ravelry….it’s a free download. A shout out to the designer for a lovely design! This past Saturday PJ came with two delights….well really four. There were socks and booties knit from her leftover sock yarn. They are so darn sweet and evoked many noises of delight! Then she showed her reversible baby hat knit from left over sock yarn. I think I have to take this idea and knit this for my Idaho nephew for Christmas…..well maybe even my Iowa nephew. They both live in spots where it gets darn cold in the winter. Freshly off Shari’s knitting needles! Whoops…..fell down into several holes again with the “family history research hole” being the primary one….can hardly believe my fingers have not been tapping, or is that typing, on this Skein Lane blog.! I have been knitting (of course)…writing on two of my other blogs.. namely Fred and Alta: Memoirs by Their Grandchildren….and What Are We Doing Now. As always much to share….tonight it is an invitation to join PJ and Terry B….and many others who knit for Afghans for Afghans. Here is the invitation from PJ…. afghans for Afghans is a humanitarian and educational people-to-people project that sends hand-knit and crocheted wool blankets and garments to the beleaguered people of Afghanistan. Join us! We are starting a new campaign and invite you to join us! We are supplying Aschiana with wool SOCK, MITTENS, and HATS for sizes 5 years to adult. American support group here. Aschiana is known for their service to street children. In fact, in the past, some of our hand-made items have been distributed to Aschiana programs by our former partner Church World Service. need. We’re honored that Ashiana would like to take our handmade gifts directly to Afghan children, women, and men. You can read more about the organization and transport methods on the Afghans for Afghans website. Be sure that hats cover ears. Hats need some stretch for comfort over forehead. Basic socks with proper heels and coverage for the lower leg (no booties or slippers or tube socks). Any foot length (measuring from back of heel to tip of toe) from about 5.5″ – 10″ will be useful.– Socks for knitters only (crochet does not work well for socks). Make sure wrist-ribbing is long enough for warmth. Careful to avoid holes at the thumb increases. Please avoid white and very light colors that soil more easily. Afghans like all colors — bright and cheery palettes! No camoflage/military-looking yarn. Use up those wool oddballs. Knit or crochet your favorite pattern or try something new. Classic patterns are best. Avoid lacy or airy patterns. Items must be very warm and durable for the harshest winter weather. Most of the recipients will have few or no possessions. Test your garment on your own children or a neighbor’s child or yourself … to double-check proper fit. Please remember, send only what is specifically requested in our guidelines. Cargo space is precious, and we can only send what is specifically requested and needed. they will await their September airlift. You may send in your packages whenever ready. We sort and pack as the packages arrive to monitor our progress. — reaching out to the Afghan people on the other side of the world with our handmade, practical wool gifts to express friendship and caring during wartime. We’re determined to continue our tradition. For your summer-time knitting, these small items should be appealing! We hope you will join us. Thank you for your generosity and support and for taking action with your needles and hooks and your hearts and hands. We’ll write again soon with a new link on our website with campaign details. In the meantime, we didn’t want to wait any longer to get this campaign going! 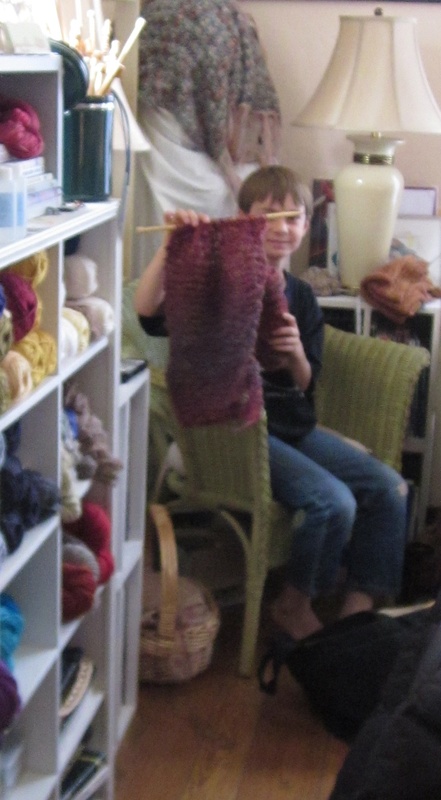 Can it be a week has gone by since our last highly energized Saturday knitting workshop? Last week it was an explosion of energy…..tales to share, work-in-progress to share, and in some cases finished garments. Each tale was delivered with its unique sense of glee. 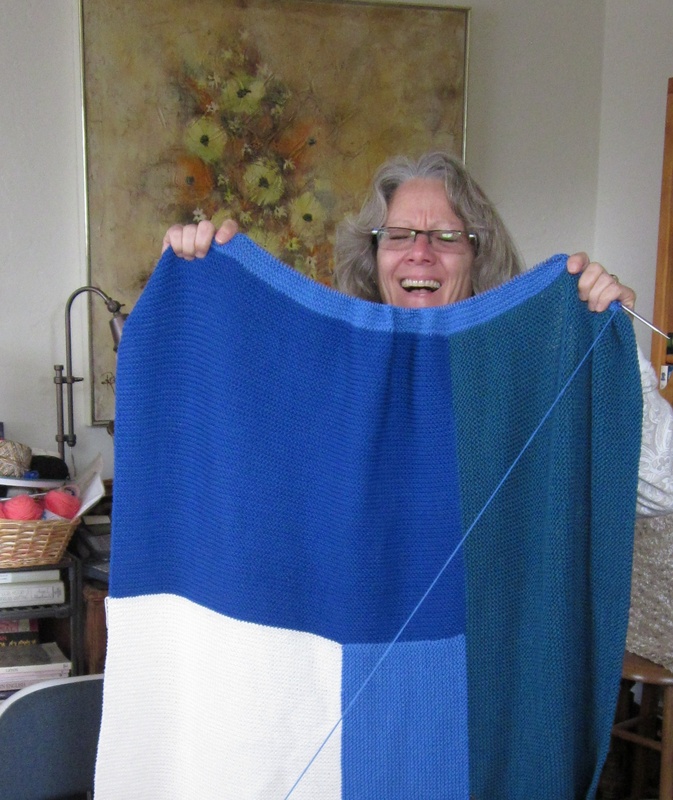 Susanne showed her latest Moderne Blanket (featured in Mason-Dixon Knitting) that is on her needles. Both of her sons have married in the last year or so and each has received this lovely blanket as a gift….well this latest one is to be delivered soon. You can check out the first one here. Once again she is knitting with Brown Sheep’s Cotton Fleece…..and finds this blanket to be great “comfort” knitting…..garter stitch that can be knit without a lot of effort…simply the joy of knitting and watching the blanket grow and the colors unfold. Check out this silly moment…. 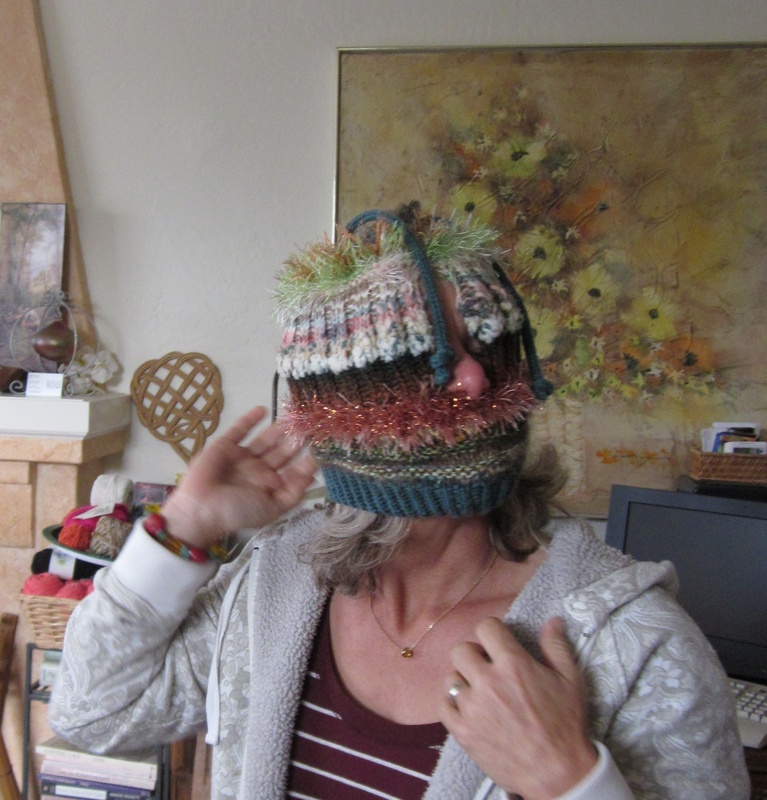 Susanne modeling this creative teapot cosy. Susanne in teapot cosy knit by Debbie H.! 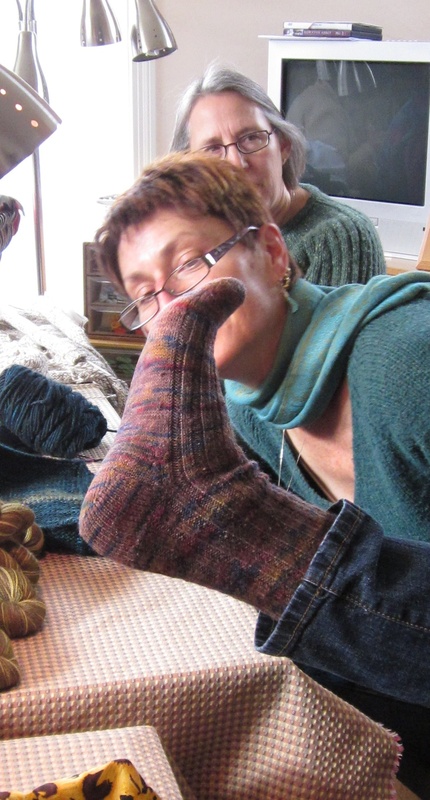 Then there was Diane….feet in the air….showing her sock…gathering looks of awe. PJ wore her No Yoke Ribbed Sweater. 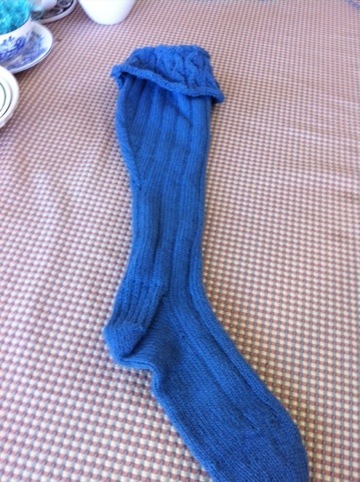 It was knit in Queensland Collection’s Kathmandu Aran. Her sweater is a perfect fit and she enjoys wearing it now. We had a bit of “technical” grafting under the armhole that turned out just fine. 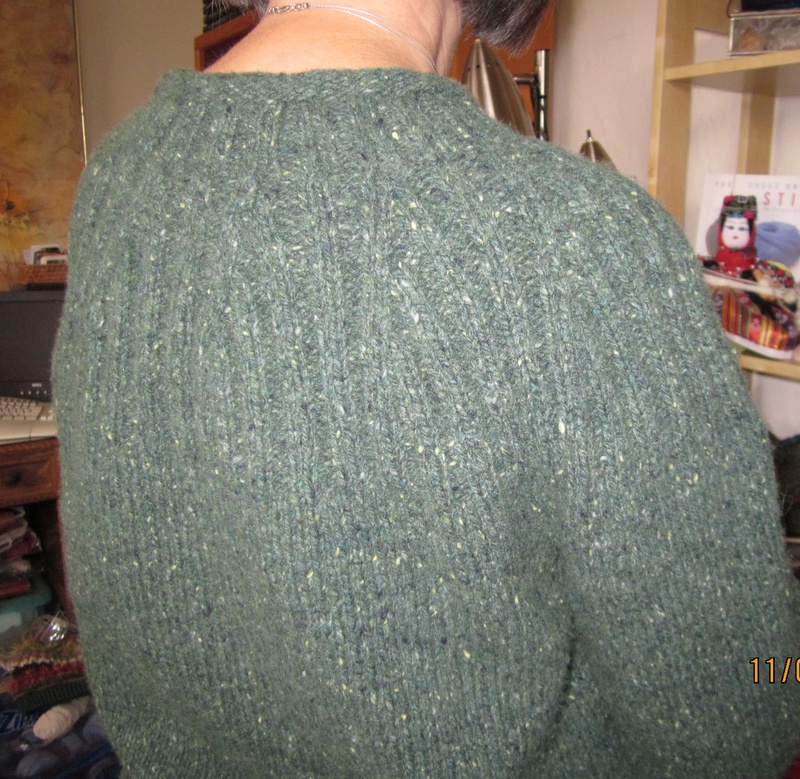 Another knitalong can be set up for this sweater….let me know and it can be scheduled to start in January. 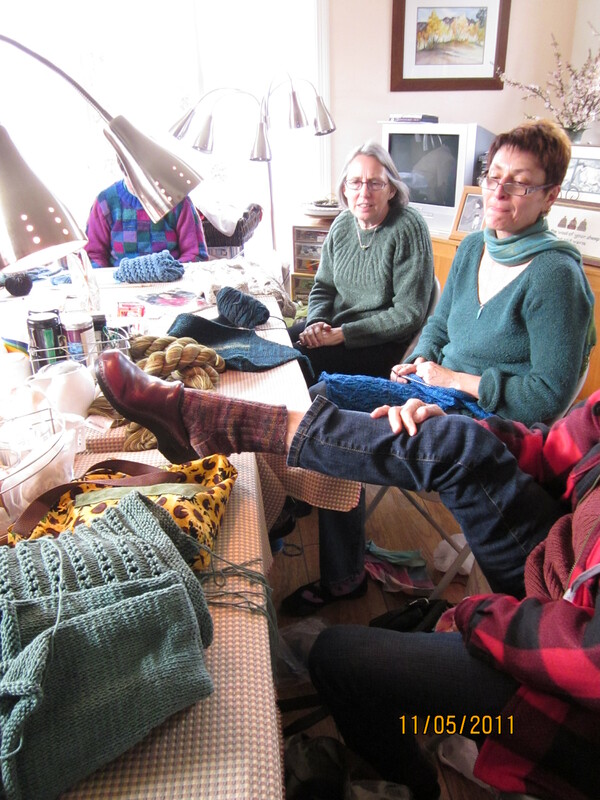 There was more show and tell of items on the needles…and a welcome back to Carol C who has been absent for this last year raising dogs and caring for grandchildren. 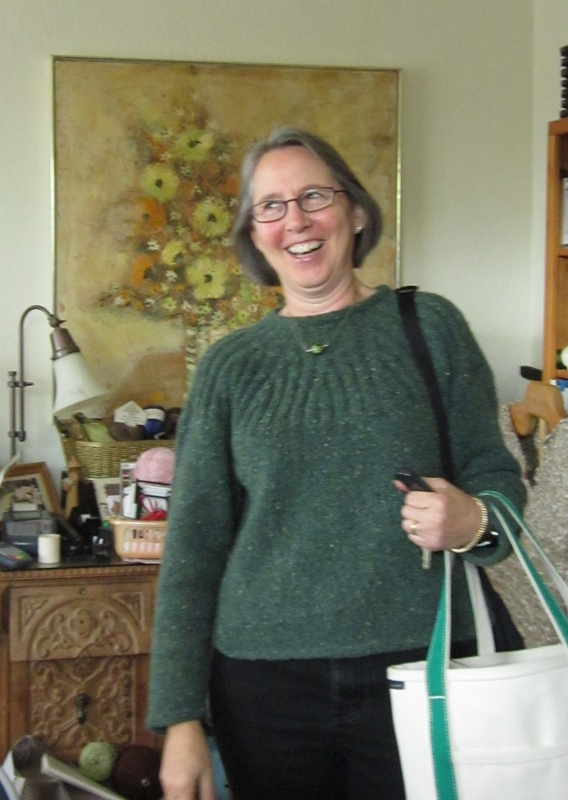 Imagine her surprise when she found that the sleeve to her top-down cardigan was safely here at Skein Lane Studio. And through all the tales, show and tell, and laughter young Rohan kept on knitting. …..now onto other Saturday of knitting. Today it’s the Saturday morning workshop – noontime mini-top down series – and the Fan Bolero workshop. Let the knitting day begin!